We arrived at the Warburton Roadhouse last night after a gruelling days to after a gruelling day on some of the worst gravel road I have travelled, and I’ve been on a few. It was bone jarring. Warburton is a small mostly indigenous community, and visitors are asked not to take photos as a respect for the indigenous and their cultural practices, especially valuing and guarding images. So we took no photos. Coming into the town you ford a creek, which was merely a trickle at this time of year and little rain. The town is really set in an oasis in that the creek gives life. The town is very small but well kept. The Roadhouse was excellent. I want to dispel an urban myth in some quarters that this is a town to avoid, but my experience is that Warburton is certainly a town to visit. We stayed in the campground behind the Roadhouse. In the morning we visited an indigenous art exhibition at the gallery in the shire building, well worth the effort. It was a retrospective of indigenous art from the region, art that told the story of the beginnings of the region and the people in it. There was also a book on display which gave the history of white settlers coming into th e region and the work of the United Aboriginal Mission. Lyn had met several of the families associated with the UAM (Wade, Collins, Schenk). The indigenous comments on the mission were indeed generous which showed positive identification of some good outcomes of the work of UAM. A breakaway called Yarla which was so peaceful, and with stunning views (above). And above, a gnamma hole just off the Great Central Road, one of three large gnammas together, with tadpoles and a fourth with algae. There were also plenty of Finches at the water holes. 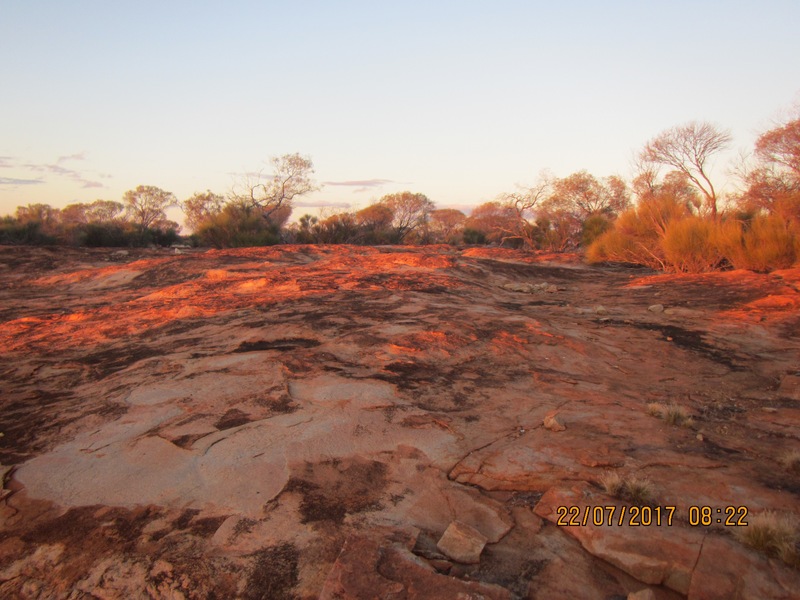 We continued on until we came to the Warakurna Community and Roadhouse, and we’ve camped in their open campground for the night. In all a wonderful day. 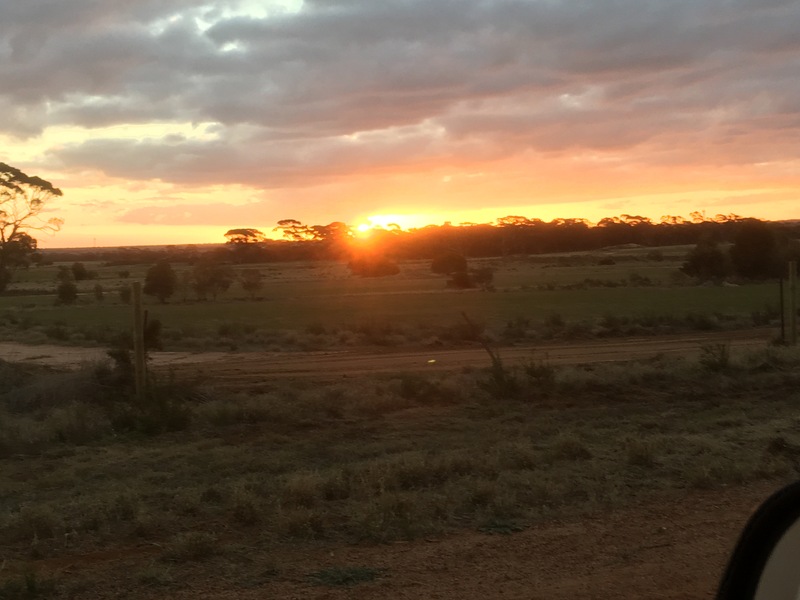 Drinks as the sun set over the beautiful vista of Giles breakaway. Big country, big sky. Then the sunrise before breakfast and departing eastward once again. Tjukayirla Roadhouse, we had lunch and managed to get diesel too. 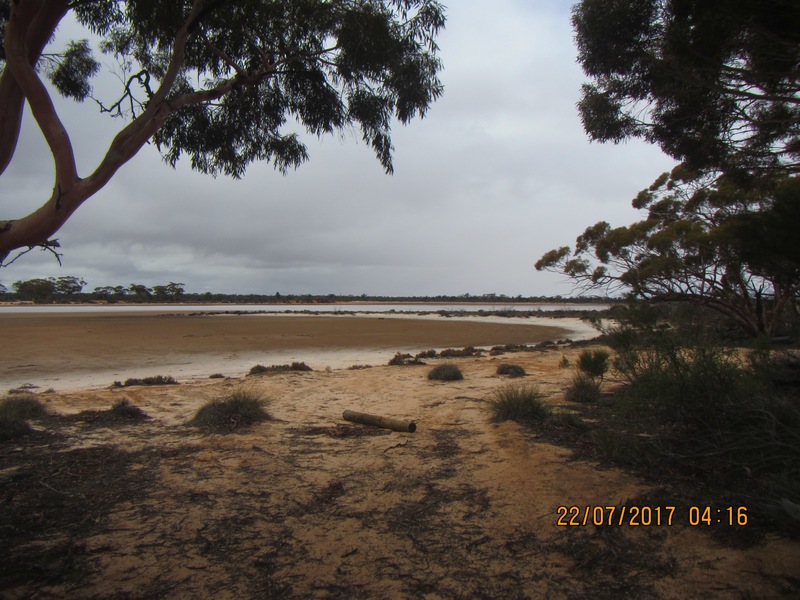 We had been warned at the previous stop yesterday (Laverton) that the Tjukayirla pump was out. It was and it wasn’t – the attendant came out and took the front off the pump and gave the motor arm a swift kick and fuel started flowing. Not that it mattered as I have spare diesel on board (about 60 ltrs) but it was less hassle to pump it. The indigenous name for the Roadhouse – Tjukayirla is, I’m told by the locals, pronounced Chewka-yurla. The locals just shorten it to the “Chookie” Roadhouse. After the Chookie Roadhouse, we stopped for a break in the long bone jarring run on the Great Central Road to look at the Desert Surf Breakaway and found this fellow, a small monitor or Bungarra. It was worth the stop with various other flora and fauna to occupy us. Tonight we made it into Warburton Roadhouse and we’re staying at the campground. Above: the main street of the historic and very friendly Menzies town. Certainly worth the visit and so much to learn. Above: the hotel at Kookynie a once bustling mining town now a few people and this lovely pub. 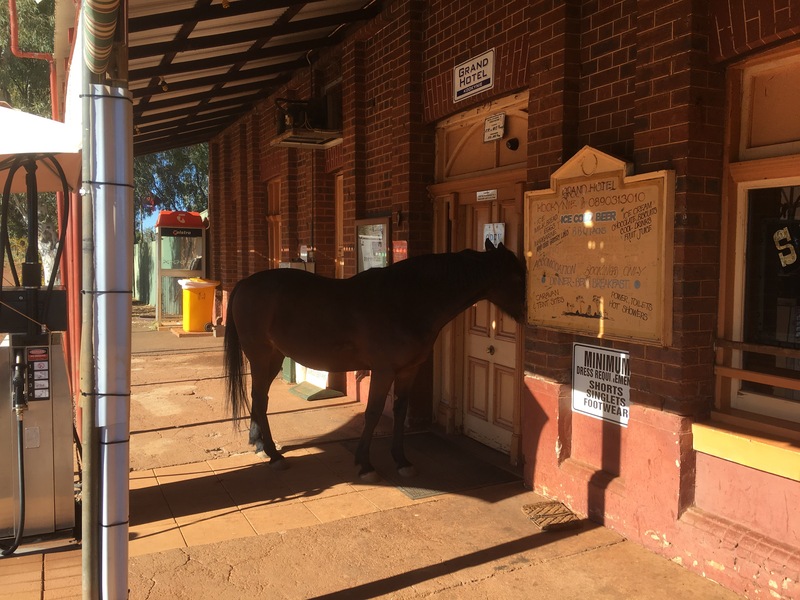 Definitely a one horse town 😀 the horse wasn’t best pleased when I moved it aside and it tried to bite Geoff when he tried to get in the door. 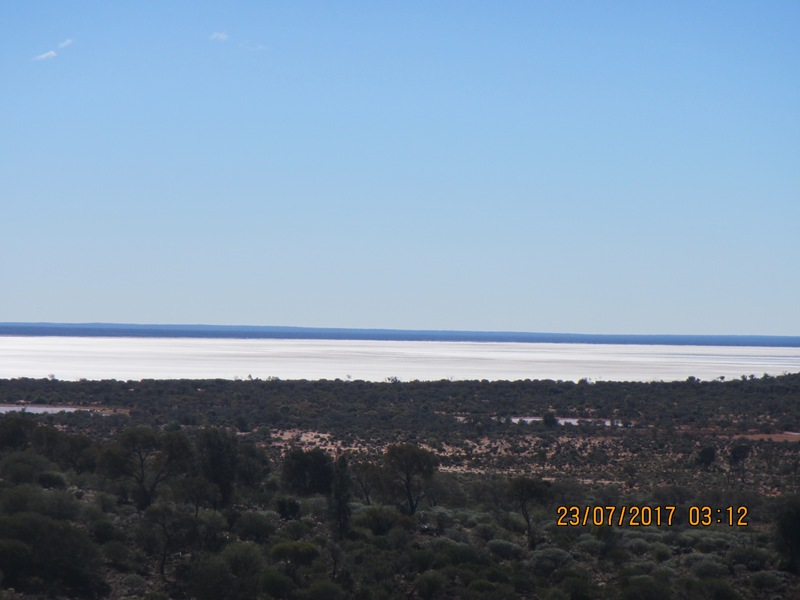 Lake Ballard to Menzies, Niagara Dam, Kookynie, Gwalia, Leonora. Above: Niagara Dam, north of Menzies, now a tourist spot, originally built as a railway dam to supply water for steam engines. 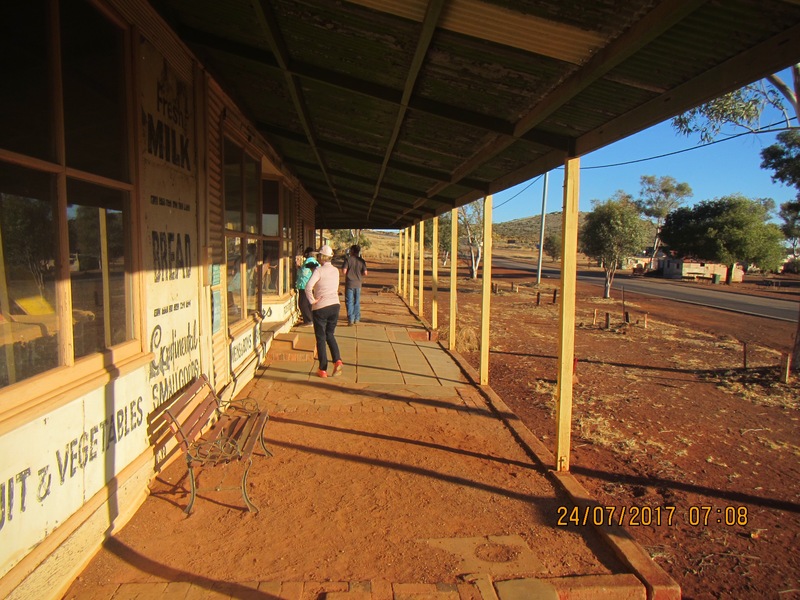 Above: the remnant of a bustling Gwalia community, just south of Leonora, this was the Mazza family stores, who boasted that they sold everything, and they did, a real slice of Western Australia’s mining history. 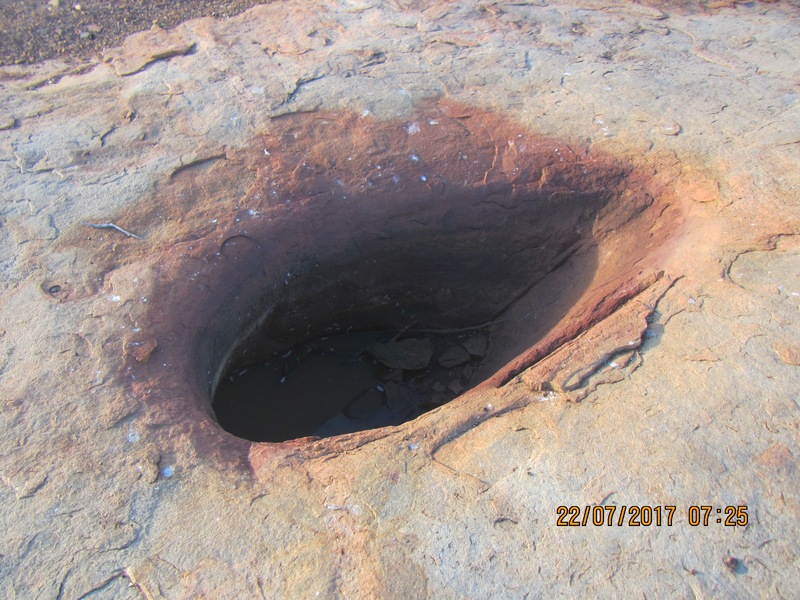 A gnamma or namma hole, a naturally worn depression where water collects. 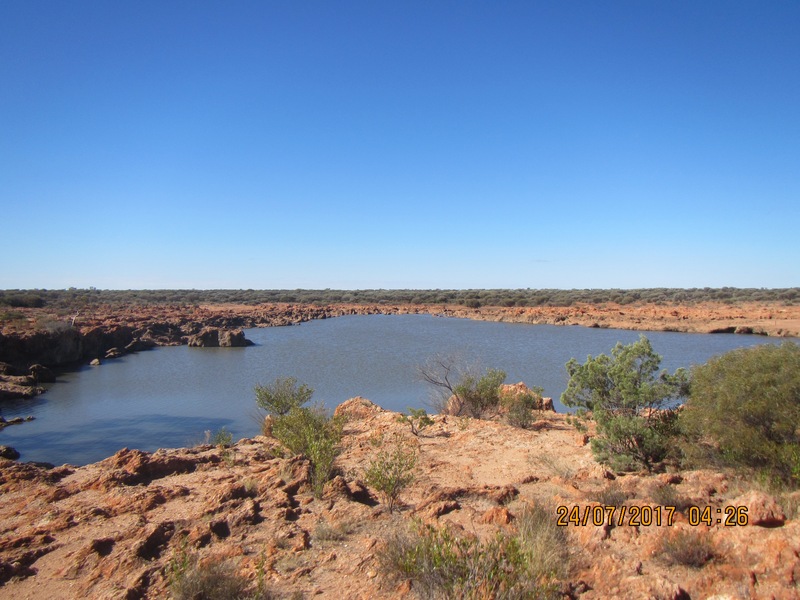 The indigenous respected these natural features as water holes, as did the bird life here at Johnson Rocks. 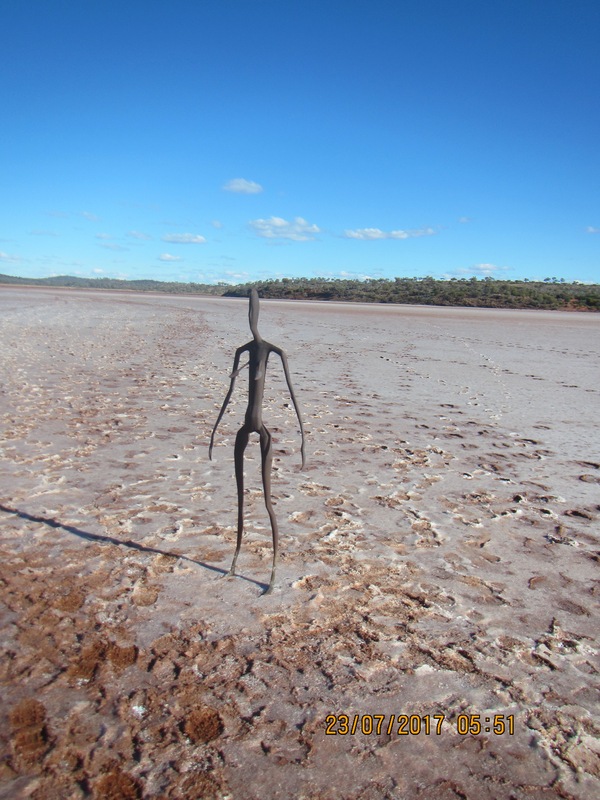 Above: one of Gormley’s many statues on the salt lake. An amazing experience. 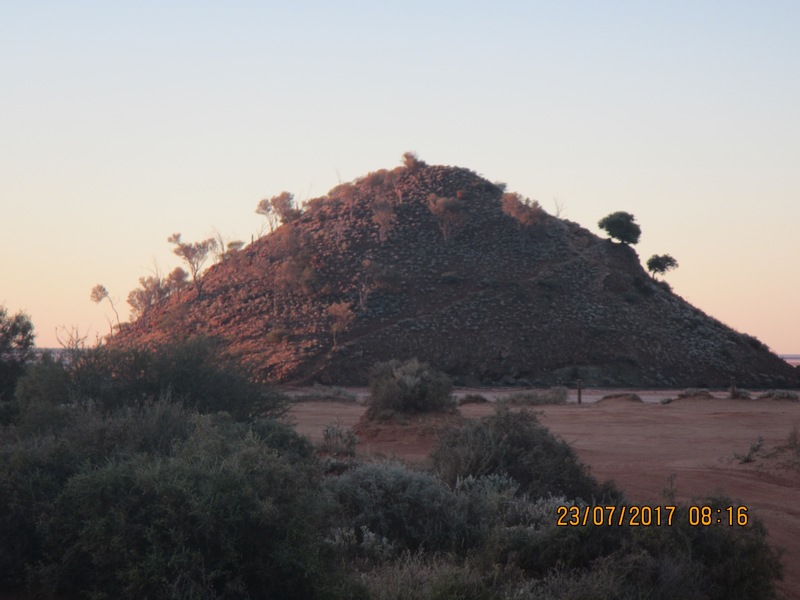 Above: Snake Hill, which sits on the southern edge of Lake Ballard and which we climbed the 100 mtrs plus for the views of the lake. And the wine, sunset and dinner by the lake’s edge. 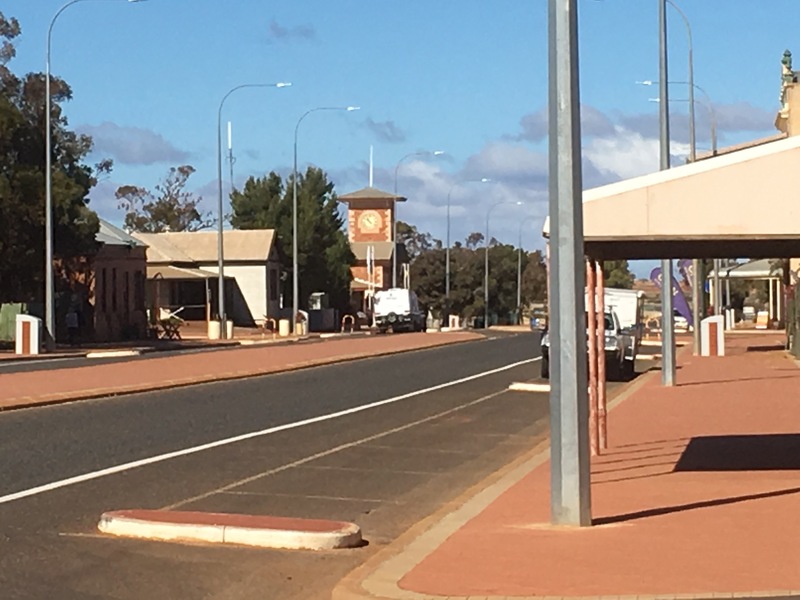 Well we left Bunbury and travelled the 400 plus kms to Merredin (via Collie for lunch, passing through Narrogin, afternoon tea in Corrigin, through Bruce Rock to Merredin) on the 21 July. On the 22 July we set off east: below is Lake Deborah, north east of Bull Finch. All in all, a great day. highlights included seeing a Mallee Fowl, normally so shy they’re unseen, but we were fortunate, plus a wedge tailed eagle in flight, the ranges around us. Mt. Jackson. The historic site of Johnson Rocks. Parrots we’d never seen before, and a wonderful sunset, and then the night sky. Glorious day. 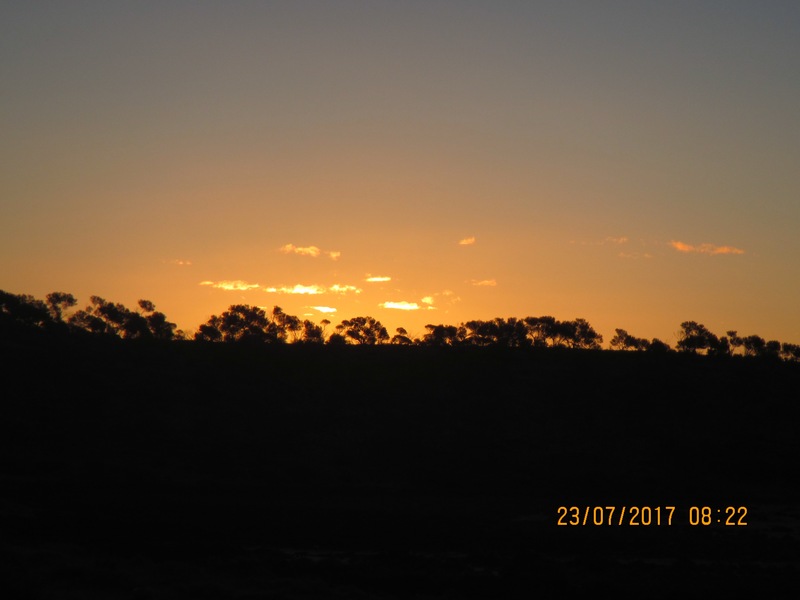 Coming into Merredin at 5.30 p.m. Watching the sun set in the west (which on so many levels is a metaphor right now). And earlier, cuppa at Corrigin. 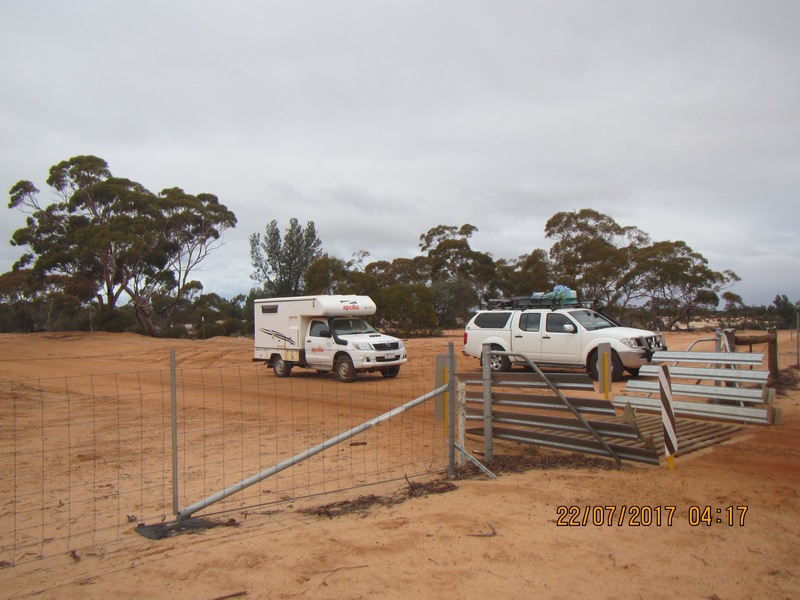 Yesterday Lyn and I drove the 172kms to Perth to pick up our hired 4×4 camper. We’ve been planing this for some time. We’re heading off with our good friends Geoff and Su out bush in Western Australia and on into the Northern Territory. Today we just shopped, stocked and packed the wagon, lots of fun trying to remember where half the camping gear was stashed since last year’s trip out bush. 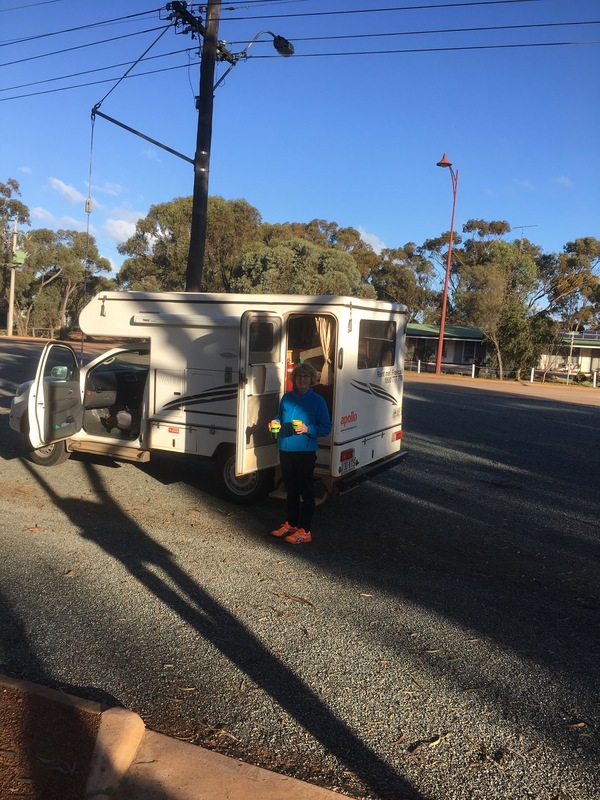 tomorrow we set off from our home in Bunbury for Merredin, where Geoff and Su live, a journey of 427kms and lots of favourite places for us to revisit along the way. I loved lollipops when I was a kid, bad for my teeth though, and now the sugar hit wouldn’t do it for me, instead it’s be a turnoff. Later at school there were the lollipop workers or traffic wardens, those who stopped the traffic so that school children could cross busy roads safely at selected points. I passed a grumpy one today, it was raining and the motorist on the opposite side had come too close to her, she was not happy. But always when I hear or read the word Lollipop I go immediately back to 1964 and that pop hit ‘My Boy lollipop’ a cover by Millie Small. It has no lyrical merit, it is pure pop, yet it is stuck in my brain, an effervescent ear worm of energy and 60s spirit. I’d love to credit this photo, it’s not mine, I found it on the net in January last year with no credit given. It shows the the disastrous bush fire impacting Yarloop. This historic town was wiped out and so was a major slice of historical evidence. I took this photo of the Yarloop Museum, in 2009, we had a fabulous afternoon touring the centre (and now in hindsight we’re so glad we made the effort – we went on a whim). It all went in the fire. Yarloop was an old mill town and this was the mill and timber workshops and the locomotive yard for Millars Timber which began circa 1901 and operated commercialy for 77 yrs. The milling operation of 1901 was built on the original site of the first mill in Yarloop in 1895. The buildings were described by WA Heritage as unique in design and world class for its period steam machinery display. The fire was disastrous on many levels, lives and homes were lost, and the historical heart of a museum complex was lost. I guess we can’t hang on to everything, but I still feel sad that it is now lost to us.